Yesterday we took a look at the first eight teams in the World Baseball Classic. Today we finish the second eight. Let’s get started. Well, there you have it. Grades for the second set of WBC unis. If you missed yesterday’s post with the first 8 rankings, here it is. Agree? Disagree? Remember, my grades are based solely on my opinions and therefore are always entirely correct are subject to debate. Let’s hear what you think. This and That: In case you’re wondering, they’re already comparing the 2006 and 2009 WBC … Check out the first paragraph of this article, which mentions “candy-striped warm-up uniforms” — anyone have pics of these? … According to this article, the Amarillo Dusters have switched a crimson and black scheme for 2009, departing from the traditional orange-and-black scheme — (insert eyeroll icon here) … Baseball coaches and managers wear uniforms, football coaches wear ‘coaching attire,’ but basketball coaches wear suits — or do they? — Here’s an interesting take on hoop coaching attire … Did you know there is a newly formed Indoor Football League? Neither did I, but they’ve got teams and uniforms and everything … So, yesterday K-Rod got a four-out save for Venezuela, leaving Mets fans wondering if he will do the same for the Mets — apparently, the WBC games do matter … For all you footy fans, here’s an article on Aston Villa and their famous claret and blue unis … We all have an opinion on Oregon’s football uniforms, and most of us have some opinion on the man for whom a font is named — here’s an article on Coach Bellotti and where he ranks among Oregon’s football coaches … The other day, the Sixers played their final game at the Spectrum — that’s the recap … and here are some pics of the 1983 throwbacks and the “old” court … Here’s more on that Philly retro night … Lots of college hoop teams were celebrating yesterday, for both the ladies and the guys — more to come today … I know I don’t hate purple, and I particularly like this shade … FNOB on display here, and a really weird numeral font besides … Why hockey is still great: Marty tries to tie Patty Roy’s win record in Montreal with the Habs in classic whites (1945-46 era jersey) … They’re not called The Orange for nothing, folks … I’m sure you knew this already, but Tiger’s back — he’s just not Tiger…yet … and finally, I’d be remiss if I didn’t post a a photo or two from the 2009 Brier curling championships, right? Oh…nice job against Puerto Rico last night, USA — mercy rule me. Enjoy the hoops and WBC today, and Beware the Ides of March. Haven’t seen the quilted padding on the back of one leg on baseball pants before like on T K Kim in this pic: http://farm4.static.flickr.com/3561/3346013891_98d37f04a9.jpg?v=0 Is this something new? Why are they cramming the pit stains on us? And who thinks they look good? Actually, it’s something old… baseball players used to wear “sliding pants” under their knickers to avoid scraping their skin when they slid into bases. They’re apparently still available, although these seem more like compression shorts than the quilted pads of the past. I agree on your ratings of the WBC uniforms. I didn’t realize Korea’s uniforms were so bad, but I thank you for pointing it out. I like seeing the various color combos for the various countries too. The Netherlands team is made up of players from all the Dutch netherlands territories in the Caribbean, ie Sidney Ponson from Aruba. The Netherlands team is almost all Latin American. Interesting that Italy and the Netherlands go with the same color scheme in the WBC that they both do in international soccer rather than using their flags’ colors. Do they do that for all their national teams? And couldn’t the Bulls have worn some â€²83 throwbacks for that game in the Spectrum? Wearing the black alts was disgraceful. 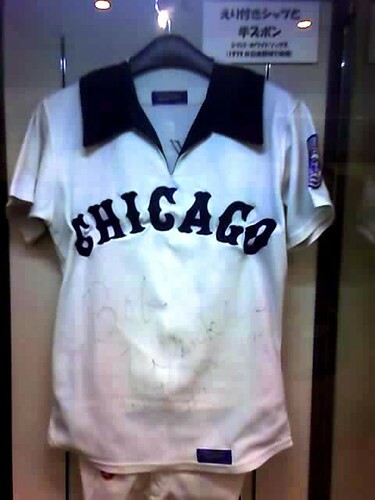 Oh, and as far as those late â€²70s Sox jerseys? Not really a faux collar. It was clearly a separate piece from the rest of the jersey, not just a sewn-in panel of contrasting color — unless by “faux” you’re referring to the fact that it didn’t continue all the way around the jersey. The Aston Villa color scheme is my favorite in all of sports. I guess I’d be remiss if I didn’t point out that these are not the only two countries in the WBC who do this (S. Africa, Australia, Venezuela). Most of the hitters are from Curacao and Aruba, but most of the pitchers are European. It just looks like the team is all Caribbean because there’s only one pitcher out there at a time. Here is a picture of the pants for Ponder High School in Texas. I can’t agree with you more on the nightmare that is Korea’s unis. What in the hell was Nike thinking?! I have liked some of Nike’s outlandish/brave designs…. but these I cannot defend. The cap just looks so cheap too, flea market cheap. I disagree with you on the Netherlands jersey. I feel they are just tad bland. I’m just not feelin’ the wordmark. Plus I would have liked to have seen an orange jersey, matched up with that pretty cool cap…NICE! I just wished my fellow paisanos Mexicanos rocked a green helmet as opposed to a black one. I think if they used the exact same typeface (the inner lines in red) for the numbers as they did the wordmark it would have looked alot sharper. Here is why the color orange is used in Holland from Wikipedia. Orange is the national color of The Netherlands, because its royal family of Orange-Nassau used to own the principality of Orange (the title is still used for the Dutch heir apparent). There is no etymological (word history) connection between orange (the fruit and color) and Orange (the name of the principality), and the similarity is fortuitous. (See the page on Orange (word) for more information.) In modern Dutch society however, the Dutch word oranje, ‘orange’ is often associated with the reigning royal house of the Netherlands. Oranjezonnetje (‘Orange Sun’) designates good weather on the Queen’s birthday, April 30. Orange is the color of choice for many of the national sports teams and their supporters. The nickname of the Dutch national football team is Oranje, the Dutch word for orange. Oranjegekte (‘Orange Craze’) signifies the inclination of many Dutchmen to dress up in orange colors during soccer matches. In the modern flag of the Netherlands, red substitutes the original orange, but on birthdays, the flag has an additional orange banner. Most geographical usages of the word orange can be traced back to Dutch maritime power in the 17th century. Mexico uniforms are the best. Great use of colors and font. [quote comment=”318265″]Here is why the color orange is used in Holland from Wikipedia. And to further that, I live in Orange County, N.Y., which was settled/established in the early 1600s by the Dutch – the local flacks try to call this ‘The REAL OC’,or some rot like that….and to make things MORE confusing, we have a fairly small village named ‘Florida’….. I don’t think USA teams ever look good in predominantly red. As Ricko surely remembers (just kidding! ), we defeated “red coats” in battle for our independence; therefore, USA in red almost feels like wearing enemy colors. Somewhat ironic, don’t you think? Plus, FWIW, when Old Glory gets folded into a triangle for display, it’s proper to see stars and not stripes. I actually wish that the Netherlands would have matched even more–an light orange uni, like their soccer kit, would look better than the black. Can anybody explain how this whole World Baseball Classic thing works, anyway? Are the international teams just thrown together for the tournament, like olympic teams? Where do the players come from if they are not professionals? Who are the coaches? Mexico’s unis look an awful like the University of Miami’s ball team’s unis, anyone else notice this? Maybe there is a tie between the two programs? There’s a thread about Dutch baseball over at Baseball Fever. Some photos, but you have to be signed in. For future reference, “footy” is Australian Rules Football…don’t use it for soccer slang! No, there is a reasoning for the teams that are in the event. There is no qualifying unlike the FIFA World Cup. The majority of the teams chosen are for the following reasons, professional leagues, other international tournaments (Olympics and IBAF) and draftees of major league teams. South Africa would be the Africa representative. Would it be nice to have qualifying, yes, but according to the IBAF there are 44 teams that have a ranking in World Tournaments. South Africa, 20th and the Dominican Republic, 17th are outside the top 16 team. Spain, 15th and Nicaragua, 12th are the only teams in the top 16, not at this tournament. So I think it is a pretty fair representation. My favorite German football/soccer/fussball team was in action today against Alemannia Aachen. I was looking at some of the photos and man are their jerseys hard on the eyes. Does anyone else have such thing stripes in such contrasting colors? What’s up with the New Era logo on the cap of one the Braves’ minor league teams? Not sure which one it is. I’m watching the Twins Yankees spring training game. It’s at Steinbrenner field. The Yankees are wearing their home BP jerseys with the NY crest. For some reason Andy Pettite is wearing the away jersey with New York across the front, while on the mound. I can’t believe you picked the team with the black jersey as your best uni. Why is it that the black alt is almost universally ridiculed, but the Dutch wear a black jersey for who knows what reason, maybe trying to look like the Orioles, and they are applauded? Not only that, but their wordmark was just plain boring. Gotta disagree with your best uni pick. Maybe they’ve got the best story, but that doesn’t make their uni the best. Re: South Africa WBC uniform… the lettering looks to me to be dark *green* with gold outline. This would also be more logical with respect to SA sporting colors. Also, as several have pointed out, many countries have sporting colors that are consistent across codes that vary completely from flag colors. This is a good thing, since flags don’t come in many different color combos and there’d be too many nations all wearing red, white, and blue. Another example is New Zealand, who generally wear black in all sports despite having the standard issue Commonwealth style flag. can you get a screen grab and send it to Paul for the ticker? [quote comment=”318279″]What’s up with the New Era logo on the cap of one the Braves’ minor league teams? Not sure which one it is. – If I’m not mistaken, the Syracuse Orangemen (now Orange) commemorate with their nickname the same movement that put William of Orange (the king of Holland) on the English throne. I know the history is WAY more complex than that but I did want to mention that Syracuse orange and dutch orange have the same roots. – ING, the dutch bank, is the major sponsor of a number of road races in North America, including the Ottawa marathon, the Edmonton Marathon, and the New York City marathon. At those races (I raced at all 3 last year) the predominant colour of banners, signs, etc. tends to be orange for ING. To add to the Netherlands/orange connection, when I lived in Germany I heard a story (perhaps apocryphal, perhaps not) that on the occasional of a particularly significant soccer match between the German & Dutch national teams, one German grocer painted all of the store’s oranges black in order to purge his establishment of the hated color. I dunno about you guys but I really dig the colored raglan sleeves that we’re seeing in the WBC! Just want to throw this in. Brian Kilrea, the winningest coach in Canadian major junior hockey, is retiring. He coaches the impeccably dressed Ottawa 67’s. If you can catch the game tonight, Ottawa plays Kingston. Kilrea will be looking for his 1193rd win in his 2156th contest. [quote comment=”318288″]Just want to throw this in. Kilrea is the classiest guy in hockey today. Random Kilrea trivia – he only scored 3 NHL goals but one of them was the first ever goal scored by the L.A. Kings. Phil, for the most part I agree with your assessment of the Mexican team’s uniforms. Aside from the pit stains, though, I am not crazy about the combination of colored jerseys and pinstriped pants. It just doesn’t work for me. Another thing I’m not crazy about is the interlocking initials on the Netherland’s hats. The serifs are too cumbersome and get in the way of the actual initials. Yet at one time, Syracuse University teams were known as the “Saltine Warriors,” perhaps because of the salt mines in the area. Where’s the “orange” in that? Good call, Jim. I rarely see those jerseys since I’m nowhere near the Ottawa region. Black jerseys are still ridiculous. But at least black is part of their colour scheme. Anyone know if the Pistons wore any sort of memorial in today’s game for Bill Davidson? [quote comment=”318262″]Here is a picture of the pants for Ponder High School in Texas. Interesting. The warmups look like Indiana’s and the uniforms look like DePaul’s. “What do these universities have in common?” you ask. A) I have degrees from both of them. B) The 2008-2009 basketball season was a little bit rough for them. Personally, any uniform that had a solid top (with the exception of the pit stain) was BORING. 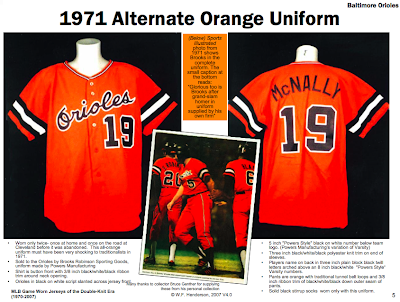 The raglan sleeves are AWESOME and here’s why: with enough exposure of those teams wearing raglan sleeves, we move ever the closer to seeing them in MLB, which would surely mean a revival of the 70’s & 80’s wacky uniforms. Yes, we hated them back in the 90’s but look how many people sport them today at ballparks. I am tired of seeing plain color tops. WBC uniforms are a breath of fresh air. My favorite is the Puerto Rico uni which includes the raglan, pit stain AND the blue piping along the edge of the raglan. I can see MLB teams moving closer to that design in the next 5 years. Also, did anyone notice the sharp-edged eye-black stickers one of the Japanese batters (right handed) was wearing today? I’ve never seen that before and would like to see more. regarding the pistons and a bill davidson memorial, it appears that they have added a black stripe (link), as has been seen plenty of times before. rip hamilton also added his own personal memorial (link), and there was another memorial courtside (link). – The Dutch baseball team actually wears orange BP shirts in the WBC… They’ve worn a multitude of colors over the last couple of decases (solid gray, pinstriped gray, orange shirts on white pants, orange shirts on gray pants, white with blue lettering and red prinstripes, solid blue shirts etc.) Thing is that our national color is the kind of bright in-your-face orange that just doesn’t work on the diamond. – William of Orange was never the King of the Netherlands. He was a German nobleman who led the Dutch revolution against Spanish rule; his decendents later became the Dutch royal family. – The Dutch team has a lot of players that come from the Netherlands Antilles originally, true. But the vast majority of them play in the Dutch league (if they don’t play in the US). So they have a Dutch passport and live in Holland. That probably makes them more Dutch than Mike Piazza was Italian in 2006 for example. Say what you want about korea’s unis…they could play in nike togas and still dominate most of the teams in the wbc…to put it simple…they are becoming a beast in baseball..and for a country with a young baseball history and the last ever (for now) gold metal in baseball, that says alot imo. and if you know anything about korean culture, you would see the lavish looking traditional color combos and designs that koreans are known to wear, like hanboks. these unis look tame to me. they have their traditional lite blue/red combo..which is used throughout korea…yellow/red/blue/lite blue are popular…anyway…i’ve seen worse…then again i don’t sit there and just analyze to the very detail athletic uniforms…but that’s your job so whatever…i still say the bengals have the worst uniform of any sport currently.